With pride I present to you this first card of me blog. I've noticed I still have to work on this blog for a while so hang in there with me. Eventually I will get it right! This card that I am gonna show to you, was made with a price pack that I had won at the Graphic 45 blog contest in January. 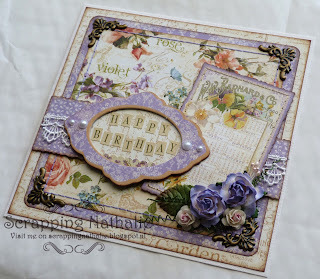 It was the Secret Garden 8x8 paper pad, 2 sheets of cardstock stickers and 2 sheets of chipboard elements. I absolutely LOVE this collection from them and I already ordered more! It is so full with gorgeous Spring colours and designs. I've used 3 different sheets of paper to create the background which was handstitched with DMC lilac yarn. Added metal photo corners and a raised banner with beautiful white lace. The lil card on top of it, was handstitched with DMC gold yarn and attached with 3D foam to raise it up like the banner. The text element is from the chipboard set and the title is from the sticker set. To add the finishing touches, I've used store brand mulberry flowers. 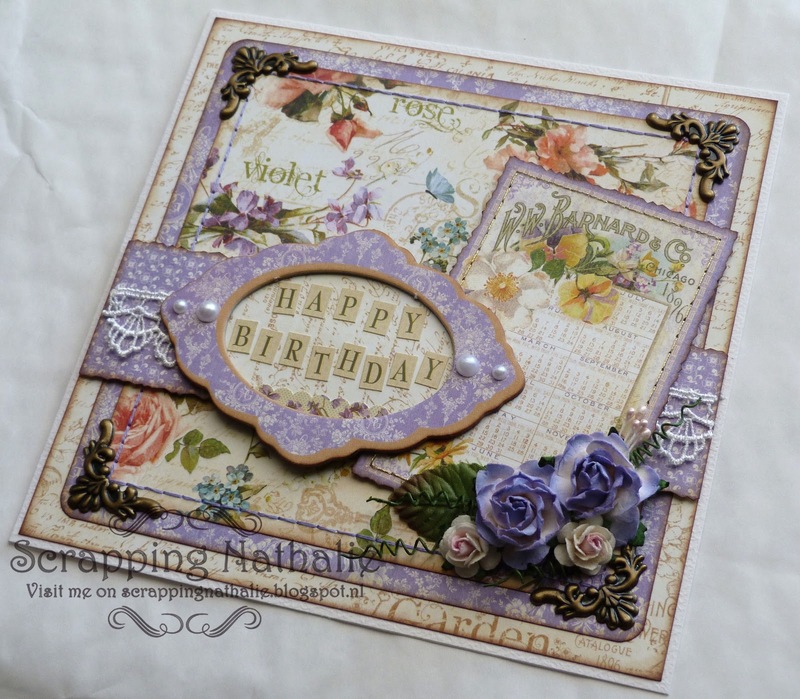 It is such a pleasure to work with Graphic 45 papers, so much detail in their designs. Beatiful, wauw, I like it!!! !